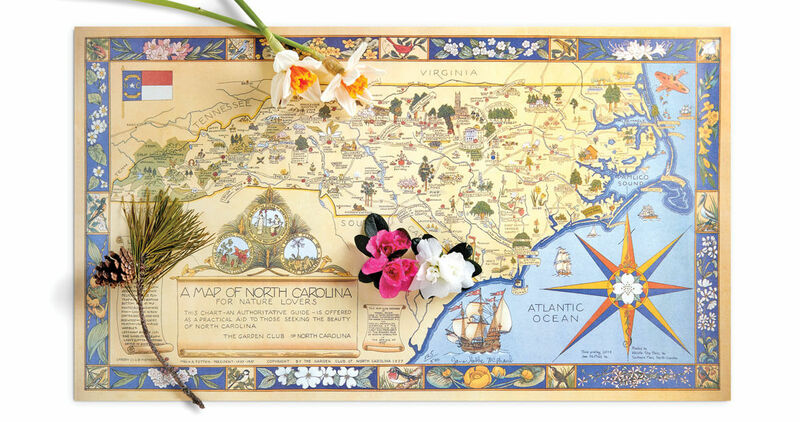 A curious North Carolina nature map — snapped up at a yard sale — reveals new wonders, old landmarks, and what we’re missing in a paperless world. Due to the advent of a technological wonder that allows you to speak your destination into your phone — which then proceeds to dictate, usually in a crisp female voice that sounds vaguely British, the quickest route to wherever you happen to be going — maps, sadly, are on the wane. Yet we’re still drawn to them. I know this because the walls of my campus office are lined with maps. Even those students who have never cracked a road atlas stare at my maps. They never notice the awards I’ve won for books and footraces (hung vaingloriously at eye level), and rarely do they scan the shelves of my library. They don’t even pause to study the awesome portrait of Otis Redding, whom I hold in the same regard as Homer, Flaubert, and Virginia Woolf. They glance at all of my maps before settling on my half-century-old copy of A Nature Lover’s Map of North Carolina. It’s not the most colorful map on my wall, nor is it the largest, but with its wonderful freehand drawings of pelicans, cardinals, and dogwood blossoms, it’s by far the most striking. Of the 10 maps hanging in my office, six are of North Carolina. I bought my very first map of the state from my father, who at the time ran an antiques store out of the former Micaville general store in Yancey County. That map disappeared in the way of favorite T-shirts, treasured records, and other things that you value even more highly after you no longer have them. But its disappearance started me down a path that led to half of my office walls being covered by various iterations of the Old North State. Though all of the maps are of interest to me and, viewed together, reveal both shifting boundaries as well as changing names — Hatorask in 1590 becomes C. Hattara in a map drawn in 1732 — they are not nearly as interesting, or as engaging, as A Nature Lover’s Map of North Carolina. The others might be more efficient and informative, but the information gleaned from them, as opposed to what I get each time I look at the NLMNC, is like the difference between Googling the meaning of a word and getting lost looking it up in a tattered, unabridged dictionary. • • •Time was, I would cruise around Greensboro on a Saturday morning, scouting out yard sales. The autumn day I came across the NLMNC was chilly, and the woman selling this treasure was wrapped up in some sort of parka, sipping coffee. She was shivering a little. I took this as a sign that she might accept less than the $50 she was asking for the map. Yard sales are all about reading signs, and timing: Either you get there first thing, while the seller is still setting up and insufficiently caffeinated, or you get there just when they’re about to call the Vietnam veterans truck to come take away everything they couldn’t sell. A shivering woman tucked up in a parka on a chilly fall day is willing to make a deal. Primed to barter. Fixing to slash prices. And I was determined to get her map. It had sparked the memory of another map, one I had loved and somehow let slip away: a map of the Southern Highlands, with points of interest colorfully and disproportionately represented alongside major highways, which were few. A black bear reared on its hind legs from a spot in Avery County between Pineola and Linville, flanked by two fat cubs. Near Franklin, smoke curled from a tepee leaning toward North Georgia. The NLMNC also contains drawings — of ships near Diamond Shoals, the Wright brothers’ biplane wobbling about Currituck, pines down in the Sandhills — but it is not as fanciful. (And maybe, all these years later, neither am I.) It has, after all, a firm purpose: to educate the ignorant on the natural richness of our state. I asked the owner if she might go to $35 on the map. She said, “There’s only a few of those around, and besides, it would cost you a hundred dollars-plus just to frame it.” Her look of disdain suggested that this was not her first yard sale. I got out my wallet and laid down two 20s and a 10 and snatched up my map — handsomely framed in an aged and grainy pine — and got out of there. Although mine is not the original version of the NLMNC — the first was commissioned by the Garden Club of North Carolina in 1937 and designed by Miss Mabel Pugh, head of the art department at Peace College — I think of it as rare. My map was designed (or updated) in 1966, and the woman who sold it to me claimed that there were few to be found, so it certainly feels more authentic than the latest version, printed in 2014. This newest rendition is fetching, colorful, and even more informative, but there’s a curious revision of the title: Now it’s called A Map of North Carolina for Nature Lovers. I like my version better. It seems to me that putting “nature lover” first makes you feel all the more in love with nature, which is central to my love of this map, and maybe, as well, to my students’ fondness for it. The map is classified as “phytogeography,” which is a branch of botany concerned with the geographic distribution of plant species. If you are as geeky as I am, you’ll interrupt the spell that the NLMNC casts on all who gaze upon it, to point out that it is an excellent phytogeographical study. The copy below the title of my version reads: “This chart is offered as a guide to those seeking beauty in North Carolina.” The 2014 revision has more syntactical flourish: “This chart — an authoritative guide — is offered as a practical aid to those seeking the beauty of North Carolina.” As much as I am in favor of the practical and the authoritative, I confess I much prefer the simpler and more modest claim on my version. But I like the word “offering,” and I especially like the word “seeking,” both of which carry a whiff of the mystical and magical. • • •Despite all that I know about the NLMNC, it remains as mysterious to me as the day I bought it. As much as I love maps, I am not blind to their limitations. Maps are by their very nature deceptive, since they contain, and allow us to visualize in a glance, what can never be contained. And yet, of all the maps I own, and all the countless others I have studied, the NLMNC most resembles the fabled map of buried treasure. Certainly some of what’s represented on iterations of the map may prove elusive someday, threatened by environmental challenges and overpopulation, or just plain old global warming. In that sense, the map is nostalgic. But it’s also capable of surprises, for just last week I happened to be studying it and noticed a drawing of a few geese above the words “Gaddy’s Goose Ref.” How is it that, in all these years, I have not noticed those geese hovering above Mr. Lockhart Gaddy’s Anson County haven for southbound geese? Maybe that’s why I favor this map over all the others: because it provides a refuge similar to Mr. Gaddy’s pond, and because I have no doubt that other “treasures,” buried in plain sight on this map, will offer themselves to me, and to others, as long as we seek them out.